Beef, water, sugar, salt, spices, hydrolyzed soy protein, maltodextrin, dehydrated garlic, oleoresin, black pepper, cure salt, corn syrup solids. The first flavors that come to me are a black pepper and light salt. There's a light smokiness as well. The chewing brings on more of the smokiness, but some garlic and onion flavor, perhaps a little more strong on the onion. With respect to the "Black Pepper" labeling, it holds up well. I get a well-noticed black pepper flavor, a little more than the company's Original variety I reviewed last week, but not over the top. The pepper tastes freshly cracked, with that sharp, pungent taste. I'd rate the spiciness as "mild medium" on my heat scale (level 2 out of 5). 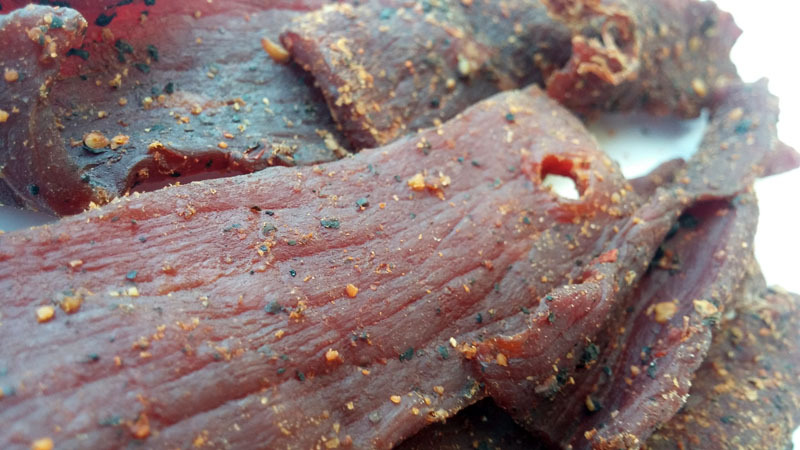 Otherwise, the primary taste profile is that of a light wood smoke flavor, supported with black pepper seasoning, and backed up with salt, garlic, and onion. It's very comparable to the company's Original flavor, but with a bit more black pepper. 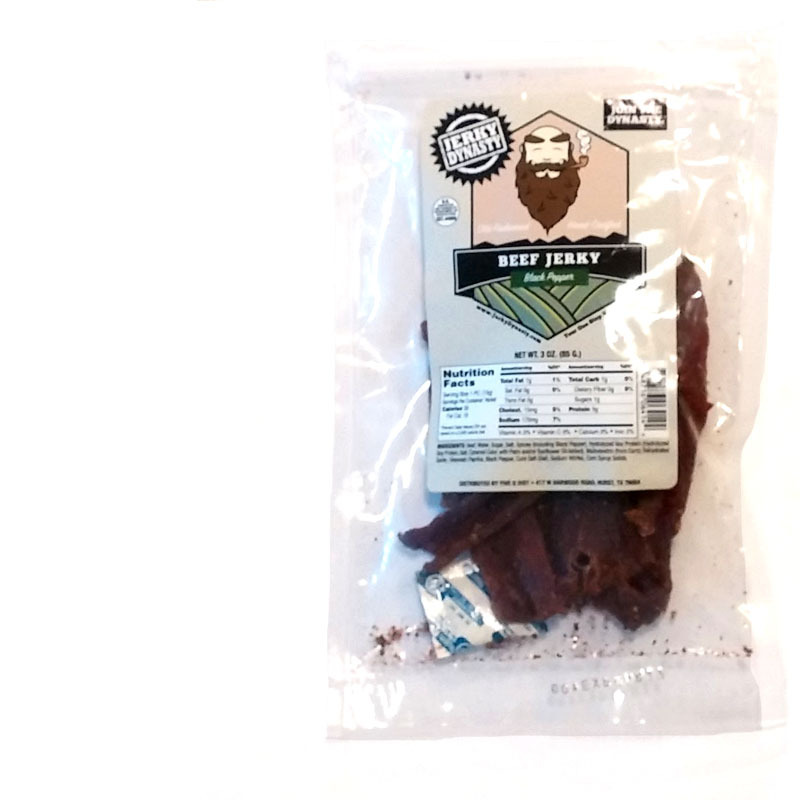 This Black Pepper beef jerky from Jerky Dynasty does a great job of delivering its advertised flavor with a prominent peppery profile, freshly cracked, without going over the top. It has the same old fashioned quality as the company's Original variety, primarily from its wood smoke flavor and steak-like chewing texture. 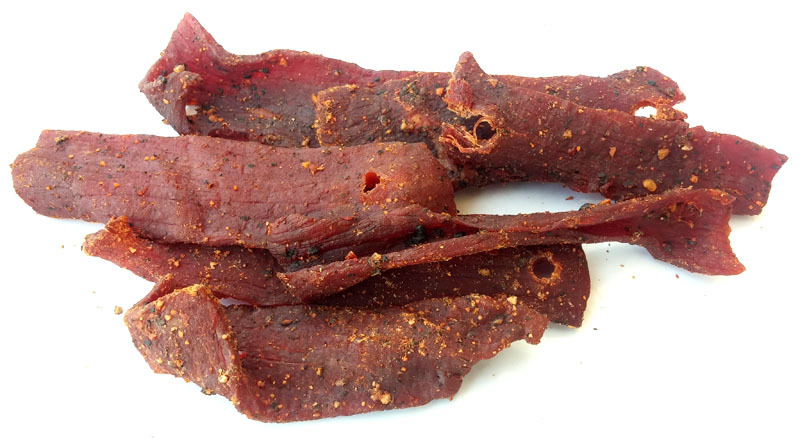 It's just toned up with more of the peppery flavor for those who want some extra tongue-dancing definition.